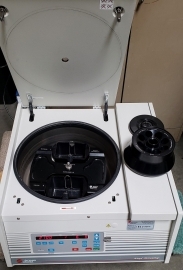 Allegra 25R Benchtop Centrifuge with Two Rotors - LabTrader Inc.
Comes with two rotors. Rotors in like new condition. 230V. Deep Well Mictrotiter plate rotor S5700, max speed 5700 rpm. 8 x 50ml conical tubes TA-14-50, max speed 14,000 rpm.